Lately I've been playing it pretty safe when it comes to fashion. After putting on a lot of weight last year and generally feeling a bit 'meh' about myself, I tended to choose the 'easiest' things I could find to wear in my wardrobe - usually baggy jumpers and oversized dresses and leggings. Whilst I still love those things, I've decided that 2016 is going to be the year I fall back in love with fashion, and by that I mean I want to start wearing the things I really love and often say 'I wish I could wear that, but it would look horrible on me', as opposed to just wearing the things I think I can get away with. When Boohoo got in touch and asked if I wanted to work with them on a fashion resolutions post, detailing the things I want to wear more of this year, I felt like it was the perfect opportunity to put my resolution of wearing what I really want to wear into action. After scouring the website for things that I always look at and wish I could wear, but usually shy away from, I stumbled across this jumpsuit and fell in love. I don't wear jumpsuits very often at all - I have a couple in my wardrobe but I usually try them on, think I look ridiculous and choose something else. This time, however, I thought 'screw it' and I'm so glad I did, because I adore this jumpsuit from Boohoo. 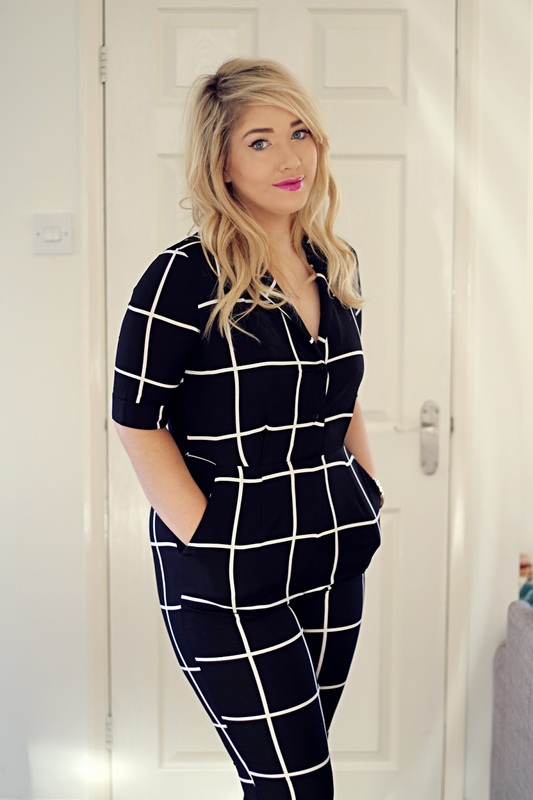 I love everything about it; the black and white grid pattern looks really chic, the arm length is super flattering and I really like the pyjama style - it's unlike anything else I own. I decided to pair it with some simply chunky black boots and minimal accessories because I really think the jumpsuit does all the talking. So, I think I've got off to the right start in facing my fashion fears and sticking with my New Year's fashion resolution to wear the things I really want to wear more often - especially jumpsuits. I think I might go and drag out my dungaree jumpsuit now! What are your fashion resolutions for 2016? I'd love to know!